A WhiteHouse panel tasked with reevaluating NASA?s plans for future space explorationhas begun culling a list of potential options - one that ranges from stayingthe current course to taking direct aim at sending humans to Mars. The10-member committee overseeing the Review for U.S. Human Space Flight Plans hastrimmed a larger list of 3,000 options down to about seven general scenarios,which it plans to cull even further before presenting them to President BarackObama later this month. ?We haveour work cut out for us,? the committee?s chairman Norman Augustine, formerLockheed Martin CEO, said Wednesday during a televised meeting in Washington,D.C. 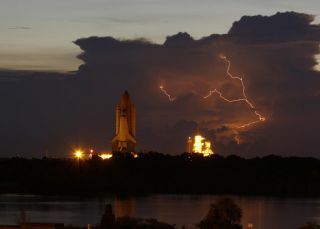 NASA?scurrent plan is to retire its aging space shuttle fleet in 2010 aftercompleting construction of the International Space Station and replace it witha newOrion vehicle. Orion and its Ares I rocket are slated to begin operationalflights in 2015 as NASA?s larger plan to return humans to the moon by 2020. Aheavy-lift Ares V rocket is also planned to launch lunar landers and otherheavy cargo. Committeemember Edward Crawley, an MIT professor, said that only three of the potentialscenarios under review by the committee take into account NASA?s explorationbudget, now pegged at about $80 billion total through 2020. That?s about $28billion less than what the agency expected when it chose the Orion and Aresrocket plan. NASA Baseline Plan: Stretch out the schedule for NASA?s current Constellation program goals to build and fly Orion and the Ares rockets within the budget available, retire the shuttle fleet in 2011, and end United States involvement in the 16-country International Space Station in 2015. Rely on international partners for crew and cargo transport until Orion and U.S. commercial flights are available. Space Station Focused: Retire the shuttle fleet in 2011, but extend space station operation through 2020. Rely on international partners for crew and cargo transport until Orion and Ares I rockets, or commercial flight, are available. ?This would be robust utilization of the space station, butallows exploration to move off into the later distance future,? said Crawley,who leads the committee?s subgroup studying destinations for human spaceexploration. ?It?s a limiting case.? Dash Out of Low Earth Orbit: This option retains the shuttle fleet?s 2011 retirement and the 2015 deadline for U.S. involvement in the space station, but eliminates the Ares I rocket entirely in order to focus on the heavy-lift Ares V rocket, which could then be used to launch Orion flights to lunar orbit, near-Earth asteroids or even planetary flybys. International partners would provide crew and cargo transport until the larger Ares V comes online. The ?dash? option is aimed at launching manned missionsbeyond low-Earth orbit as fast as possible, ?therefore it makes no sense for usto do anything other than rely on international partners and commercial[companies] for crew access,? Crawley said. Theremaining scenarios under the committee?s review would likely exceed or equalthe current budget planned for NASA?s exploration goals, Crawley said. Theyrange from a more direct repurposing of space shuttle technology to sendinghumans straight to Mars, though all could set the stage for potential in-orbitrefueling capabilities. More Directly-Shuttle Derived System: This scenario calls for flying the space shuttle through 2015 and eventually replacing it with a system that more heavily draws on the shuttle hardware, like its external tank and twin solid rocket boosters. A potential Side-Mount Shuttle, which would use the tank and boosters to launch a cargo pod or crew capsule instead of a reusable orbiter, is one such plan. The shuttle would fly beyond 2011 at a rate of up to two flights a year and the space station would fly until 2020. Eventually, commercial crew launch services are envisioned. Deep Space: This option would retire the shuttle fleet in 2011 and extend space station operations through 2020. It suggests developing U.S. crew launch capability as a backup to services provided by international partners and commercial interests. The focus would be building a heavy-lift vehicle capability of launching astronauts on lunar orbital missions, near-Earth asteroid missions and planetary flybys. Lunar Global: The shuttle replacement plans for this scenario are similar to those for the Deep Space option, but the fleet would still retire in 2011 with the space station continuing through 2020. Instead of setting up a short-duration outpost on the moon, however, the aim would be for extended stays for more exploration. ?This would prepare us to take the next step to Mars, havingspent some time on the moon,? Crawley said. Mars Direct: The final option under the committee?s eye largely skips the moon and focuses on the sending astronauts directly to Mars. Like others, it includes retiring the shuttle fleet by 2011 and extending the space station through 2020. International partners and commercial companies would provide crew launch services while NASA develops a fleet of Ares V rockets to launch crew and cargo to Mars. The plan would only send humans to the moon or near-Earth asteroids in order to test hardware for the Mars mission. With theirhandful of scenarios in hand, the spaceflight review committee plans to meetAug. 12 for one final public meeting to discuss the final options beforesubmitting a final report at the end of the month. Some committee membersWednesday said NASA, and the United States in general, should choose to tacklethe most challenging projects in space. Bohdan Bejmuk,a former Boeing manager leading one of the committee?s subgroups, said thatwhile flying in space is always hard, getting to low Earth orbit is slightlyeasier than reaching the moon, or moving out toward Mars. Buying commercial launchservices to fly crew and cargo to low Earth orbit, he explained, wouldfree NASA?s top minds to target more lofty goals. ?NASA hasbrilliant people," Bejmuk said. "Get attention of thesebrilliant people on the harder tasks, and think of buying the easier tasks from[commercial] industry. ?NASA would show off their skills by doing the hardstuff?I think that process would elevate NASA in stature in America. ?